We made a rushed trip up to our house again today, as we had to mark on the floor where we want the change between the carpet/vinyl. This we did and took a photo of it, to make sure it does go in the right place. There has been a bit of progress. 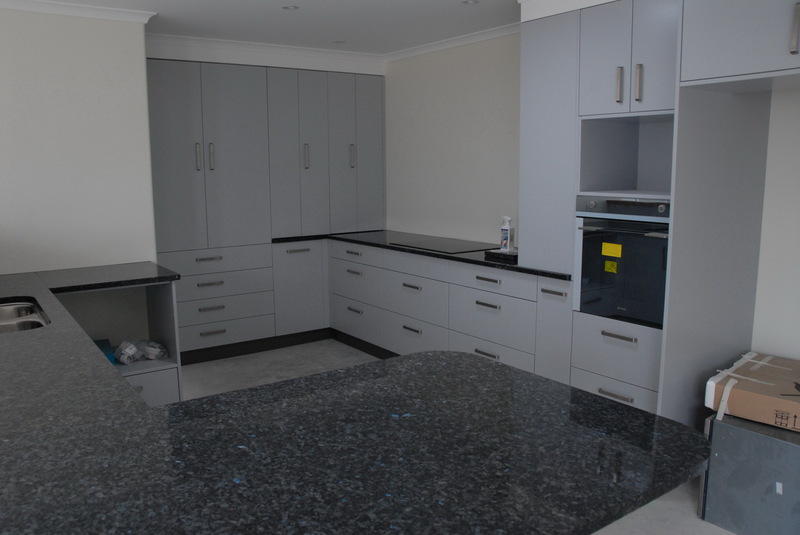 We now have a wonderful granite bench top. We all really like it and are so pleased we upgraded to the darker colour. 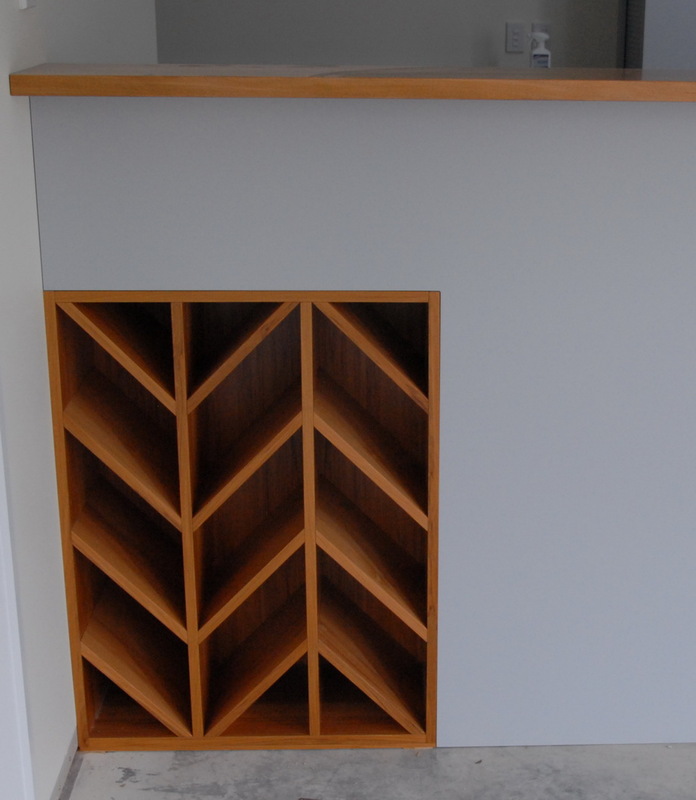 One other thing we are very happy with is the rimu wine rack. This is our design. We had to push a lot to get it, but it looks really great. The solar light tubes are amazing. Today was very cloudy and gloomy and we thought they wouldn’t be bringing in much light, but even then the light was wonderful. Before this our hallway was really dark and gloomy. 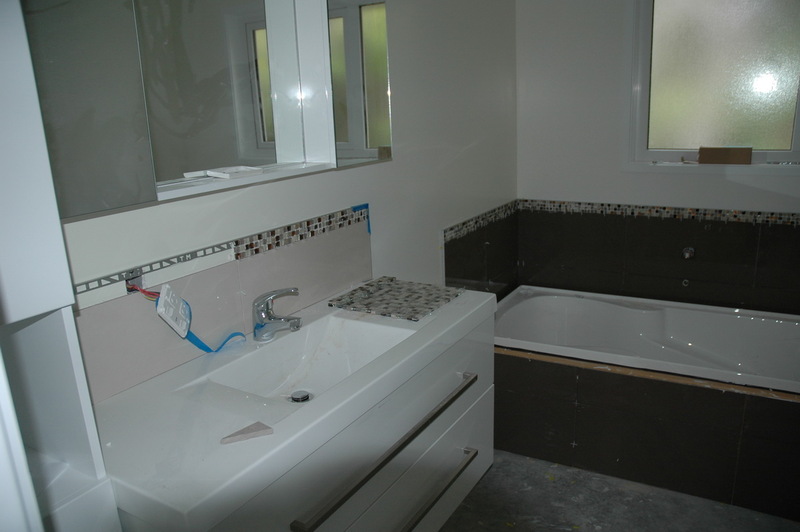 They have started the tiling in both the bathroom and ensuite. But in the bathroom there is a real problem. The tiles around the bath are fine and what Elizabeth chose, but they have put different ones above the vanity. These are the same as in our ensuite, but even then I am not sure they are the right ones. I don’t think I would have chosen a beige colour tile!! So we are going to check the colour of the tile we have written down. If it is the right one, I just made a mistake and will live with it. But the ones in the main bathroom have to be changed. Why would we use two different colour tiles in the same room? Here the colour doesn’t look too bad, but in actuality it looks murkier. So our trip today was mostly good. 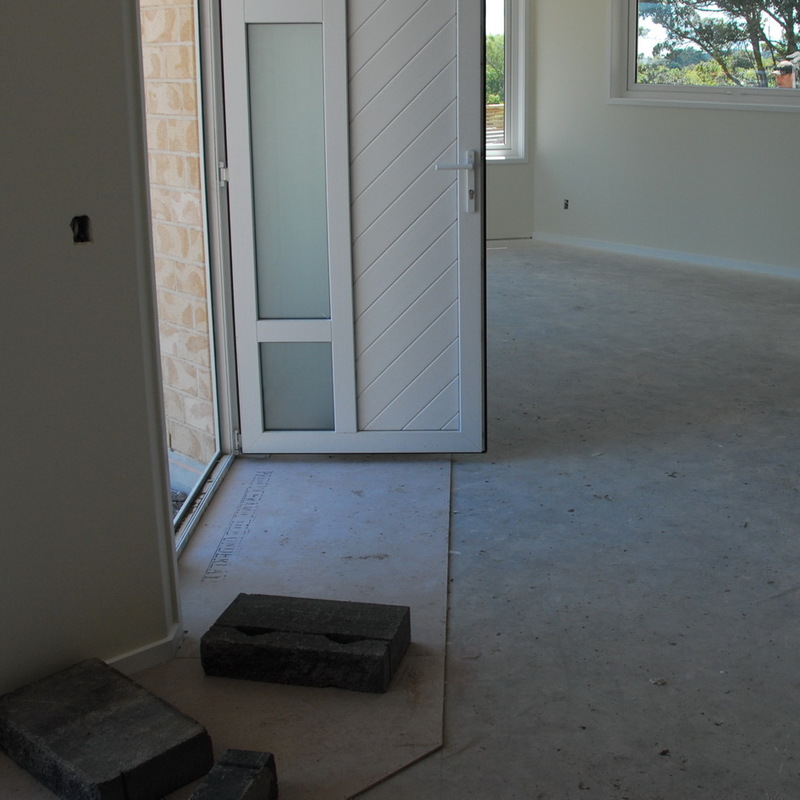 We will be going up again on Tuesday or Wednesday to look at the carpet and vinyl which is being laid this week. Just two weeks on Tuesday before we move in. That is very exciting, scary and stressful! 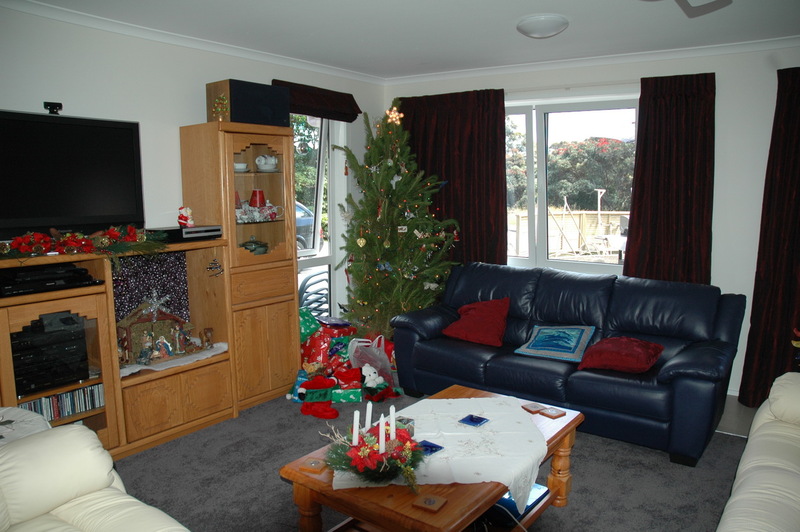 Mostly we are looking forward to living in Waikanae. But of course we will really miss our wonderful view here. Our packing here is going well, and am pretty sure we will get it all done. We have given piles of stuff away and even thrown a lot out. We still have more to give away and more to throw out. It is quite amazing what we have accumulated in almost 36 years living here. We need to get in touch with the moving firm to get some boxes, packing tape and blank newsprint for the rest of the packing. So far I have been using boxes that my neighbour Pauline has been getting for me from her merchandizing job. Thank you Pauline. Martin rang Elizabeth and me this morning from work to say we had to go up to our house to make a decision about what sort of skirting board light fittings for the hall we wanted. So instead of doing more packing we rushed up there. Wow, what amazing progress there has been since last Friday? 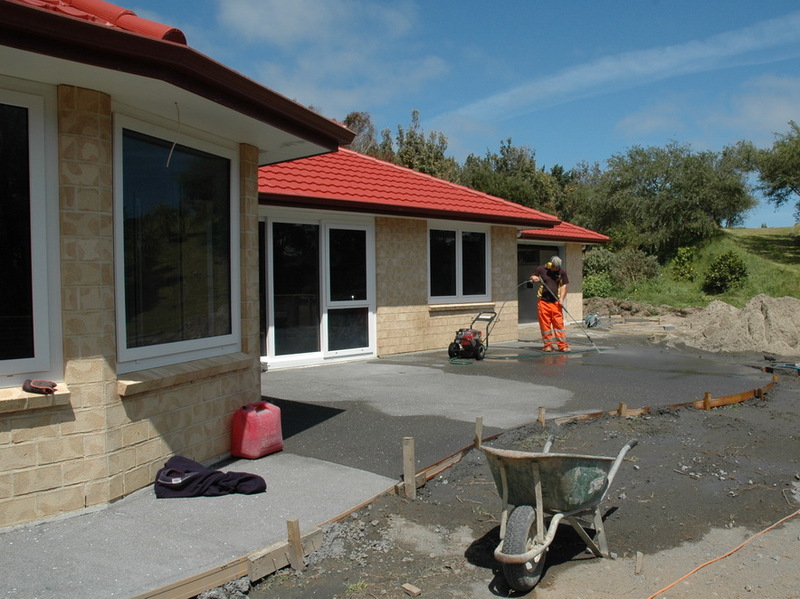 We now have a driveway, which looks really good. That and the patio still don’t have the top coating that gets sprayed on yet. This will make the drive and patio look quite a bit darker than it is. I love the curves in the drive, patios and mowing strips. There will be lawn and or a garden to the left of the drive here. For those of you who thought we should have had the drive wider, we will still have plenty of room to turn our cars around before heading back down the drive. Inside there was quite a bit of progress too. All the door handles are now on the doors. I am a bit worried about the ones on the sliding wardrobe/closet doors. They are attached by a screw which is sharp and I think they will really hurt your fingertips when you use the handle. Maybe something else will be done so that won’t happen. 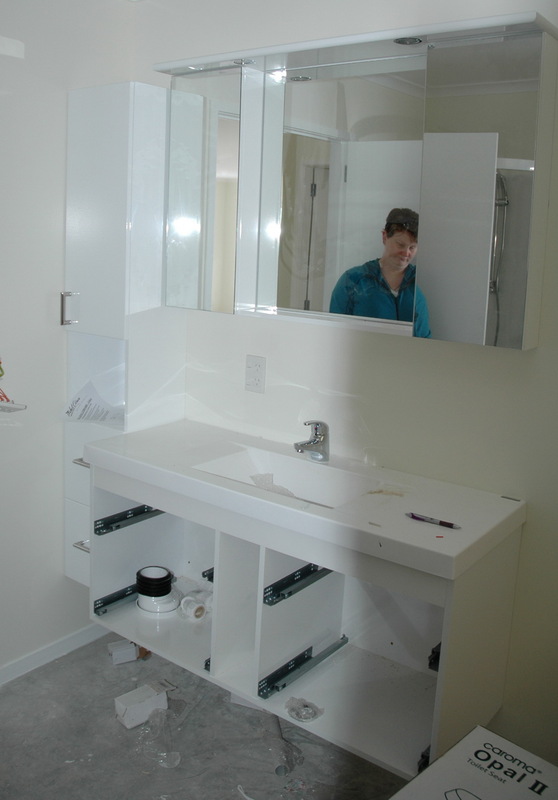 The cabinets in the laundry are almost all installed including the laminate bench top and the sink unit. 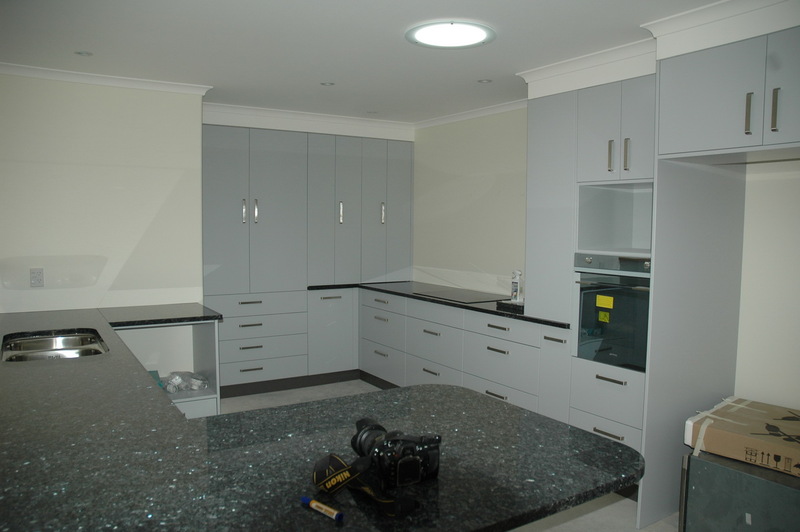 The kitchen is also nearly all installed, though we saw a problem there too. This unit with the glass doors doesn’t seem to be right. At the top right corner you can see it doesn’t go right to the edge of the bit coming down from the ceiling. This means that it doesn’t line up with the wall going down the hall. It just doesn’t look right. Martin and I are going up again tomorrow to try and sort this out. There are some other things Martin has to check out as well. The piece of rimu on the top of the up stand really looks very nice. This will match our dining room table. Not sure when the granite bench top will be delivered. 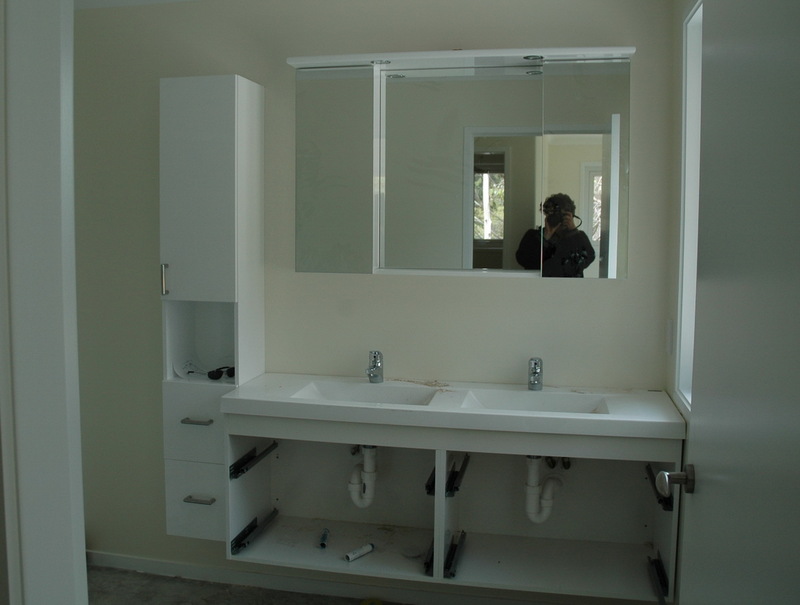 The fittings in both bathroom and ensuite are now in place except for the toilet. This is our ensuite. This is the main bathroom. None of the tiling has been done as yet. We were told that would start again yesterday. So not sure what is going on. 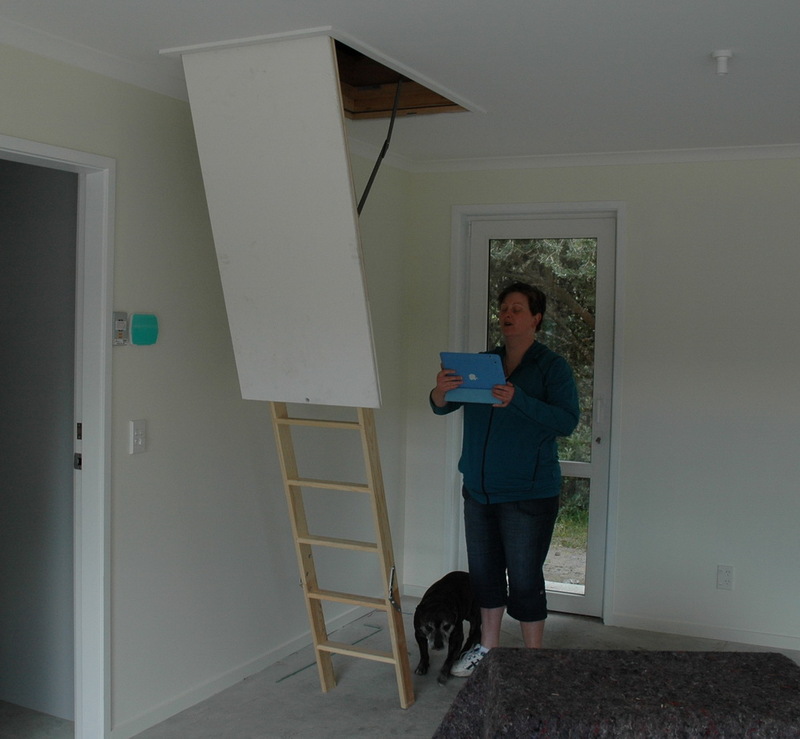 The ladder up to the loft space has been turned around which is very good. We are wondering if it is supposed to have a handrail attached though. In the photograph on the instructions it has a handrail. We now won’t have to do a ninja jump from the ladder to the flooring up there. You will still have to mind your head! 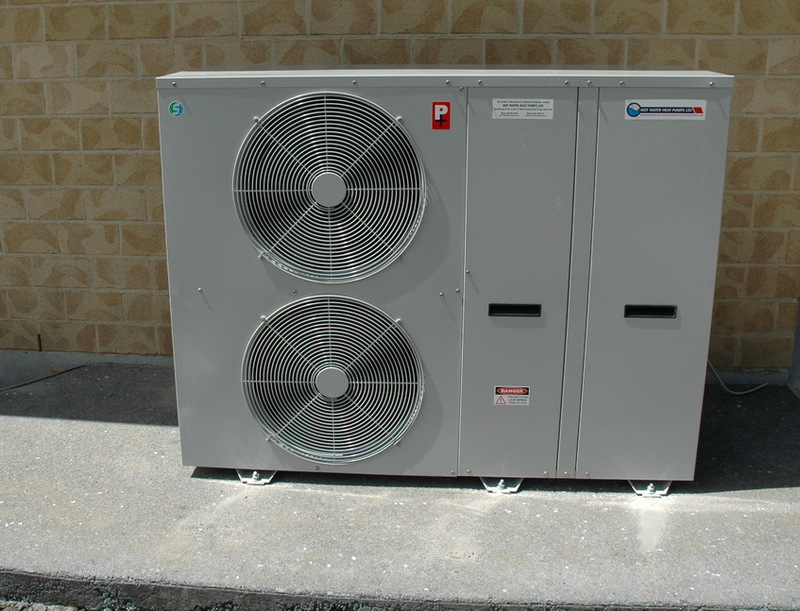 The heat pump unit has been installed outside the garage as well. This is really huge. The window seat is in place, but not totally finished yet. It has six drawers in it for DVDs etc. 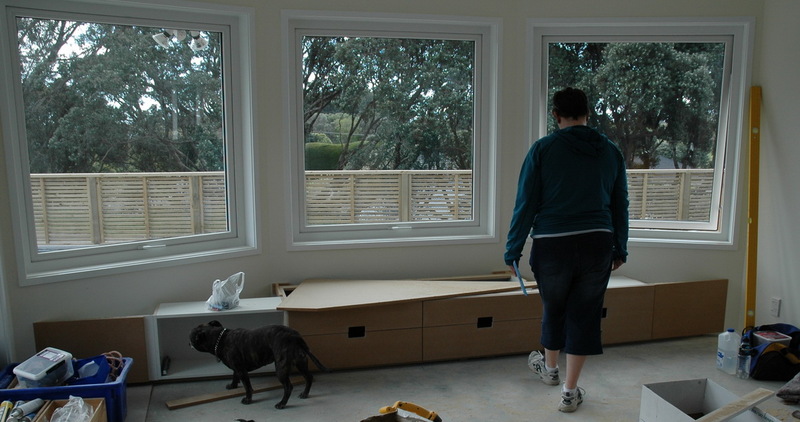 We still have to find a material to use for the squab on top of the window seat. I had thought of using the same material as the curtains, but it would not be suitable to sit on. It would be very scratchy on your legs and behind. So I don’t think I could get a colour to match, so think we may go with something more the colour of the walls. This we will also use to recover our dining room chairs. Oh, by the way, the dog belongs to the plumber. This is the third dog that we have had on our building site. That is all for today. Maybe another update tomorrow. We went up to our new house yesterday to meet six of our friends to show them over and have lunch later at our local café. Things have been progressing, but not things that would really show in any photos. 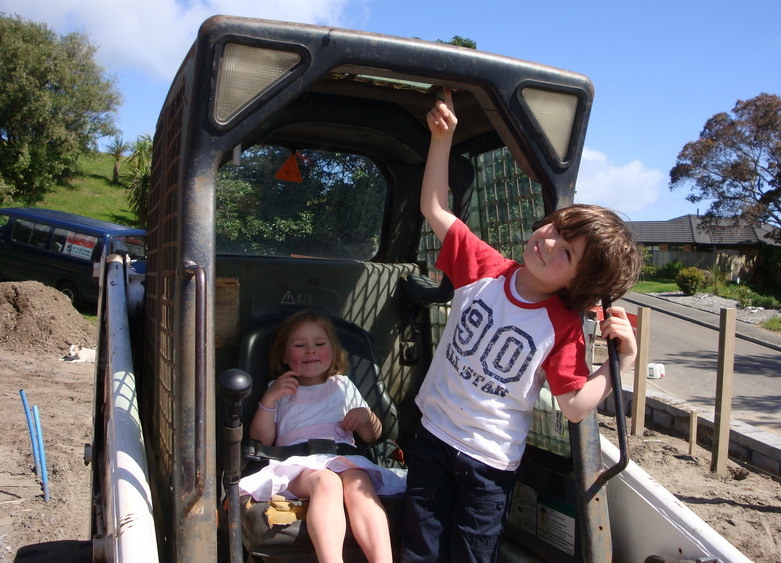 That is the reason I haven’t done a new blog for ages. We now have just three weeks from yesterday before we are supposed to have our key handed over and do a walk through to check everything is OK. That will be on 23rd November. 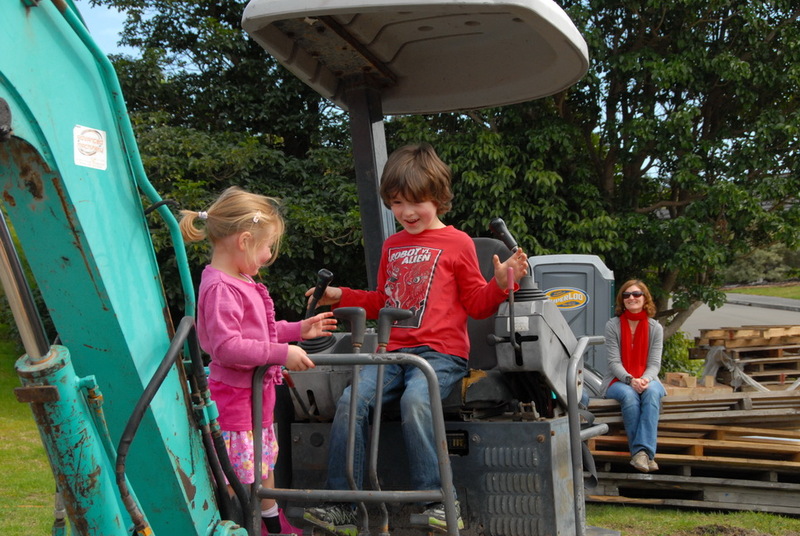 Then hopefully we will be moving in on Tuesday 27th November. The packers will be packing on the Monday and the Tuesday. 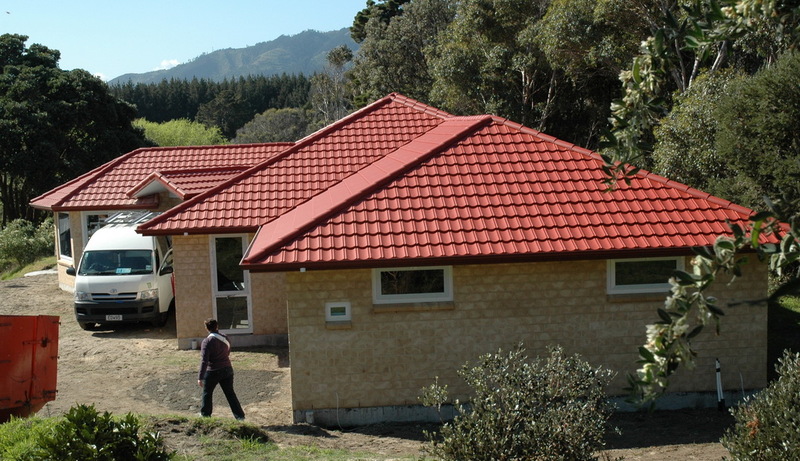 Then we will have Wednesday and Thursday to go back to Maungaraki to do a final clean through before we hand the keys over and get paid on Friday 30th November. 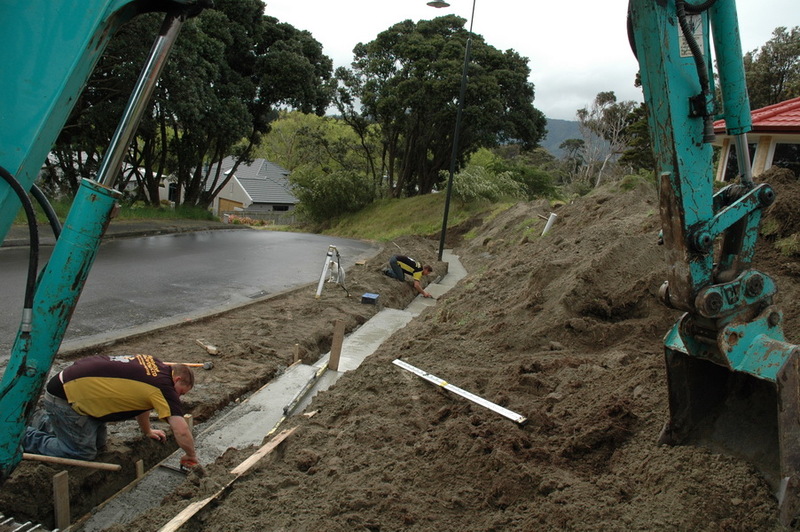 There has been a little doubt as to whether everything will be finished on time. But we really can’t push it out any further, so it has to be! Over the past few weeks we have been busy packing up and clearing out a great deal here. We have taken everything out of our ceiling space and slowly gone through it and given a lot away and thrown even more stuff out. We have done the same for everything that was stored under the house. This is still cluttering up our garage, as we have not gone through it all as yet. It took a long time to go through all our books. As Elizabeth and I now have Kindle E readers, this was a bit easier than if we did not have the Kindles. We have given hundreds of books away and are keeping just those that we know we will read again or are reference books. As a lot of these books are very old, I had a great deal of trouble doing this job, as the dust really got to me and I had problems with my sinuses. We have almost finished this task and all the books we are taking have been packed and sealed into small boxes. Thank you Pauline. Elizabeth has been packing all our CDs and DVDs and also cataloguing them all as she goes. This also has been a very long job. But it will be very good having a list of everything we have. She has even labelled each box with what is in that particular box. Thank you Elizabeth. We now have quotes from three moving companies. These range from just under $3000 to over $6000. The cheapest quote also includes all our stuff in our storage locker, where the expensive quote has that as an extra! We will still have to pack most of our stuff other than furniture and breakables. 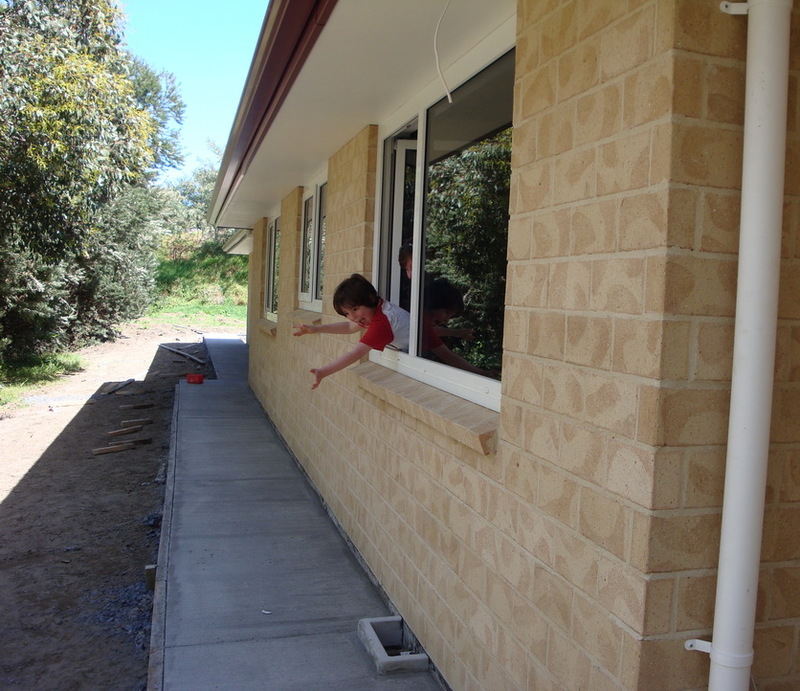 When we were at our new house yesterday we noticed that the kitchen has been delivered. Some of it as flat packs and some already made up. When we saw the area this covered we wondered how it is all going to fit in the actual kitchen! 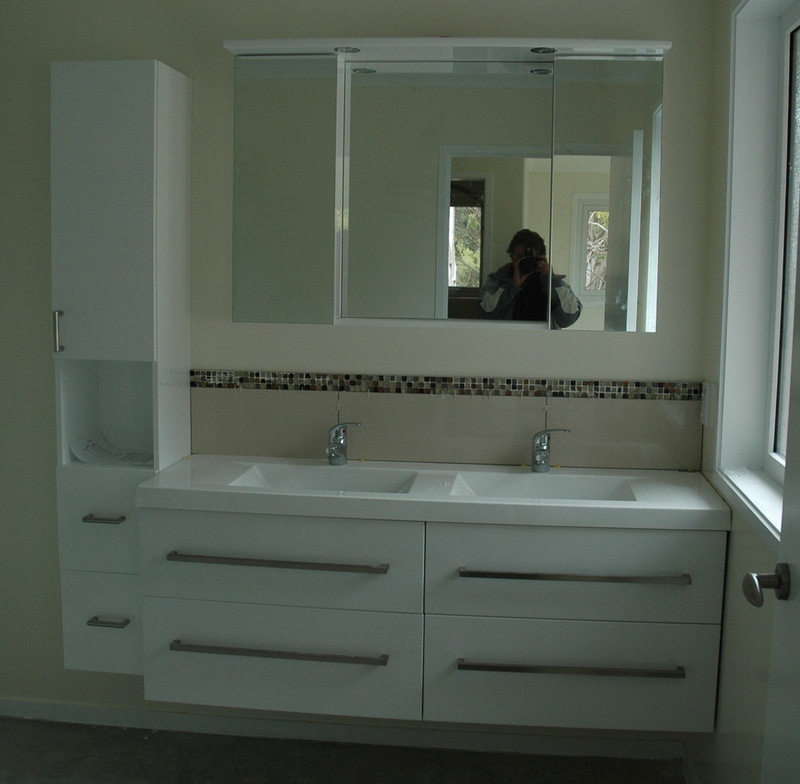 It did include all the laundry cupboards as well, so that will go in a different room. The kitchen and laundry will be totally installed by next Tuesday evening. 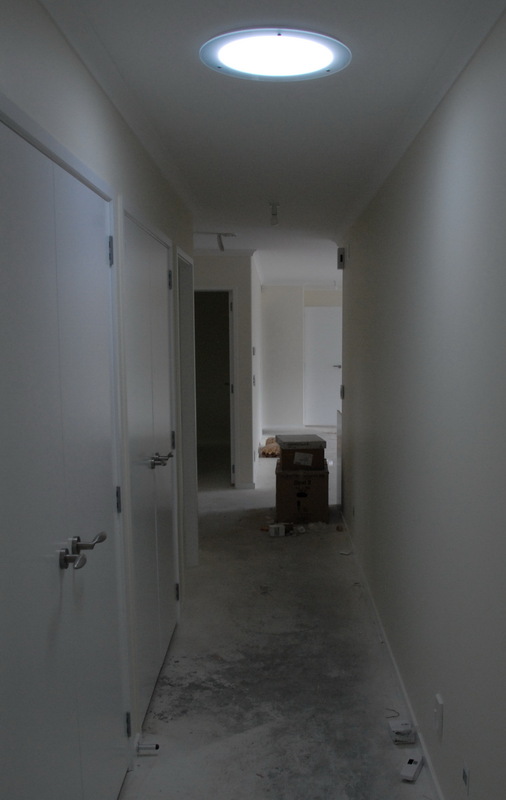 All the electrics in those rooms will be connected by the end of Wednesday. One thing we are very happy with is the colour we have chosen for the walls throughout the whole house. This is always tricky, as when you see a small sample, you don’t really know what it is going to look like covering a whole wall and more. 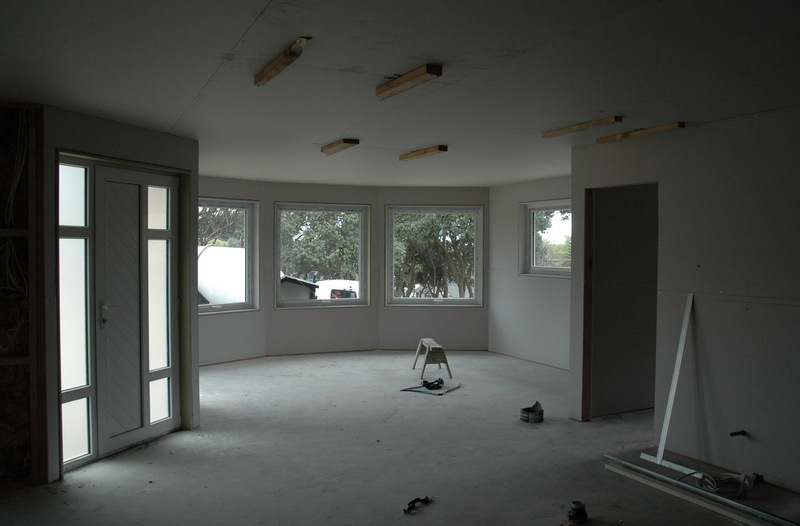 It is a very pale, clean, lemon with white ceiling, architraves, skirting boards etc. I didn’t want cream, as cream can often look rather dirty. The kitchen cabinets are a very pale grey with a bright red glass splash back behind the hob and all the way around the kitchen to 150mm. no higher, as every time you have to cut a hole in the glass for power points it costs $150 and there are lots of these power points! The granite is a darkish grey with almost iridescent bits in it. Hard to describe. 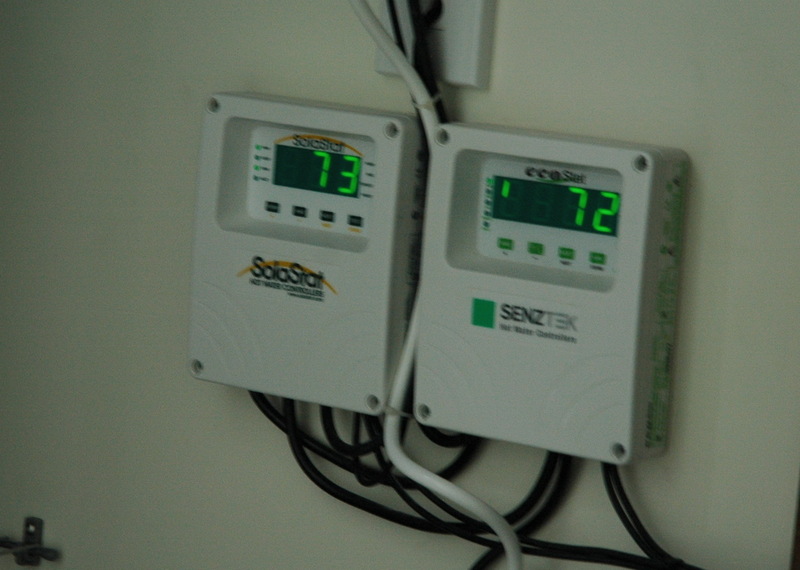 This won’t be installed for a little while, as they don’t measure that until the kitchen is completely installed. 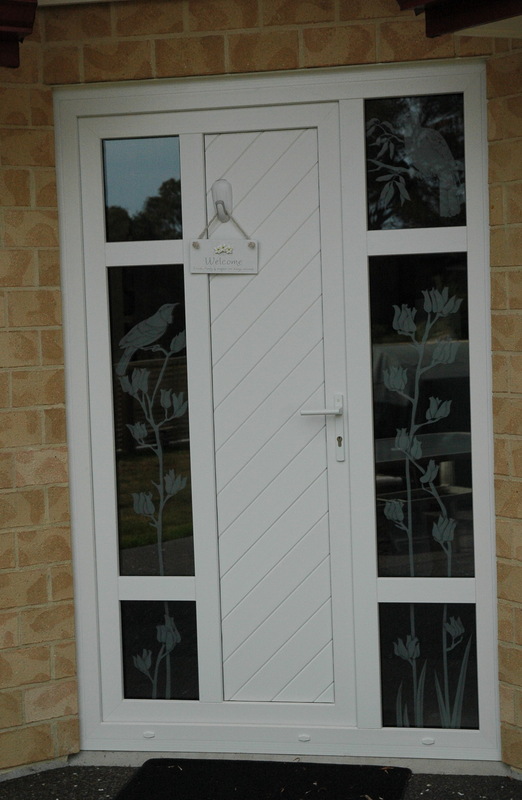 We now have a design for replacing the frosted glass in the front door and side panel. We really don’t like the frosted glass and didn’t even realize that is what we were getting. We are now having some etched glass. 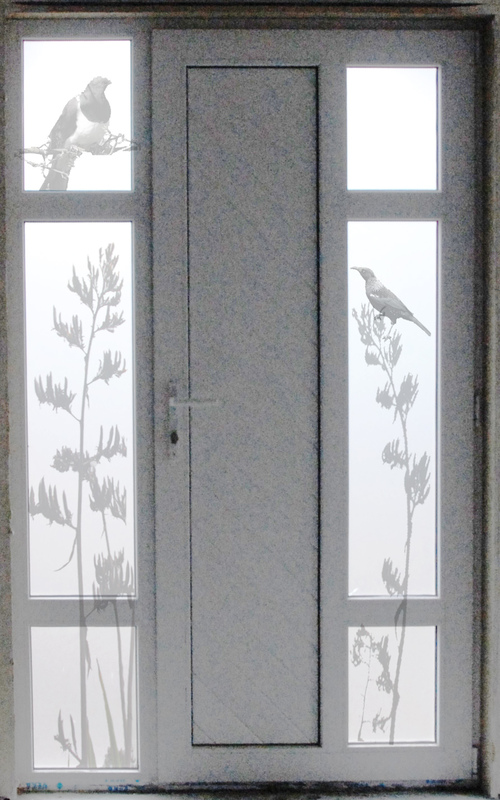 The etching will be on tinted glass like the rest of the windows. This actually makes the etching stand out even better than on plain glass. Martin did a lot of work finding the right photos to do this and then getting all the aspects right so it would fit the appropriate size of pane. Martin’s original of these panels looked like the photo on the right. We have also now had a quote for replacing most of the tinted glass along the back of the house. 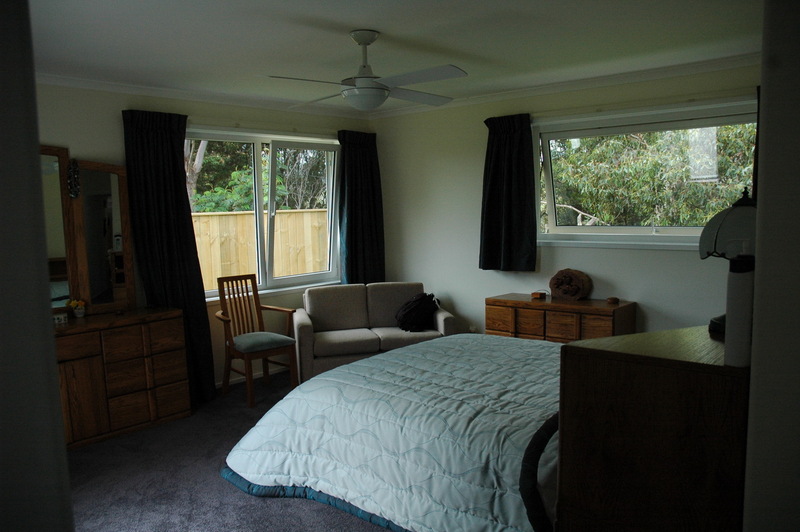 Because of the trees behind the bedrooms and bathroom are very dark. We will wait till the new year to go ahead with this. There have been quite a few problems along the way. 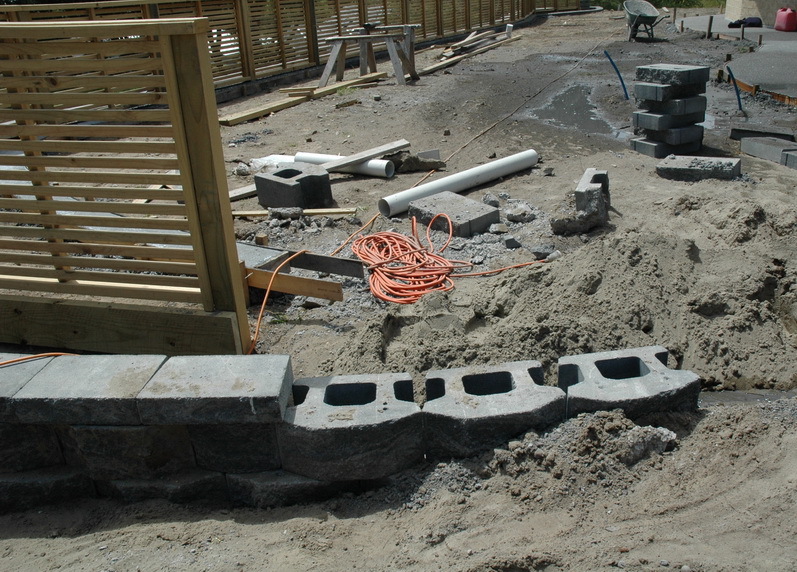 We have had to get our landscaper to move the end part of the retaining wall twice now. Callum has been very understanding about these changes. Thank you Callum. What we want and what other people think we should have quite often differs a great deal We don’t want to have too much concrete and therefore want the drive to be two cars wide for about a car’s length outside the garage and then for the drive to be just one car wide down to the road. Other people and the landscaper point out that means you will have to back down the drive and not turn around. We don’t think this is any problem, as most people have to back out of their drives anyway and it is what we have always been used to doing. 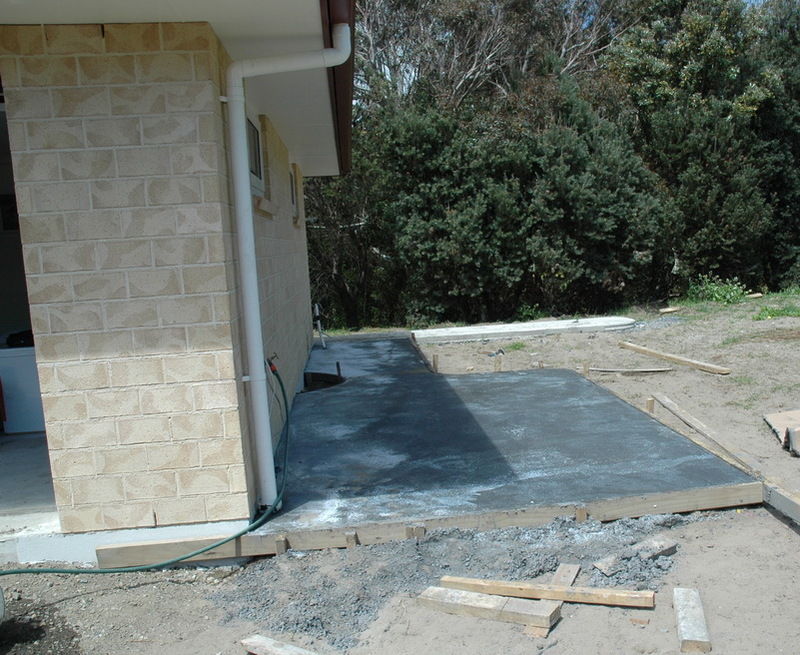 Directly outside the garage the width is almost three cars wide, as we have a concrete pad for the trailer alongside the west side of the house. 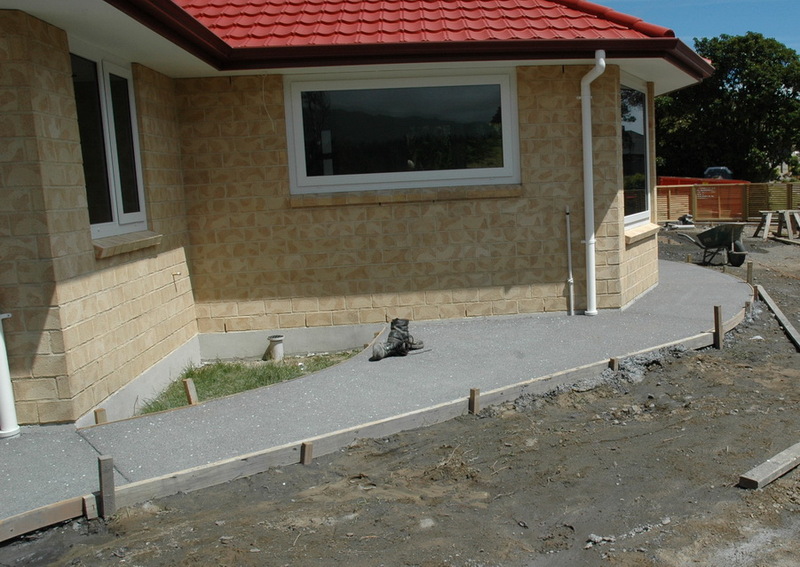 The heat pump unit for the under floor heating will be positioned just to the left of the path going to the front of the photo. There is also a very small garden between the two garage windows. This is for a passion fruit plant. We know these plants like being surrounded by concrete. They must like the lime that leaches into the soil. Below is the part of the retaining wall that has had to be moved twice. 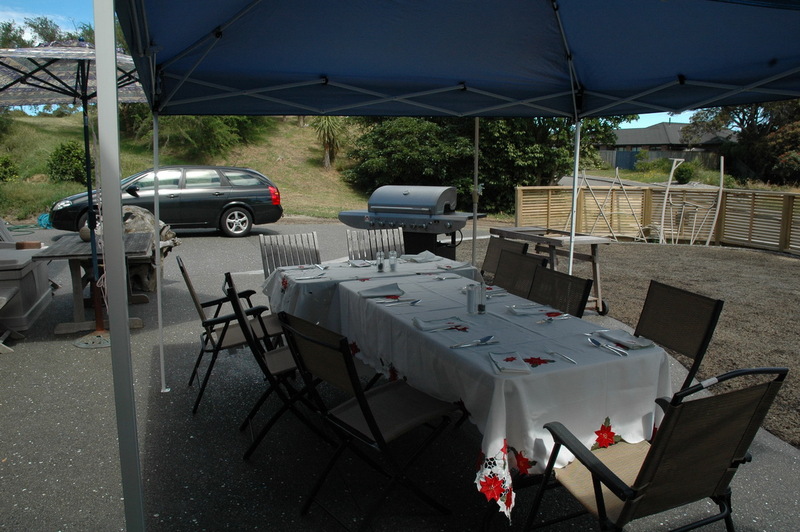 This next photo shows the extent of our patio, though this is just once part of it. This part of the main patio is six metres from the house to the outside edge. Can’t remember how long it is in the other direction, but longer than six metres. There is another small patio outside our bedroom. 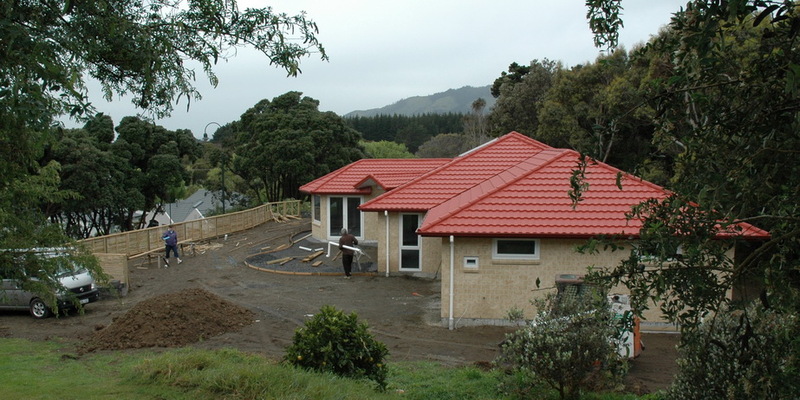 The patios and all the paths are connected right around the house. 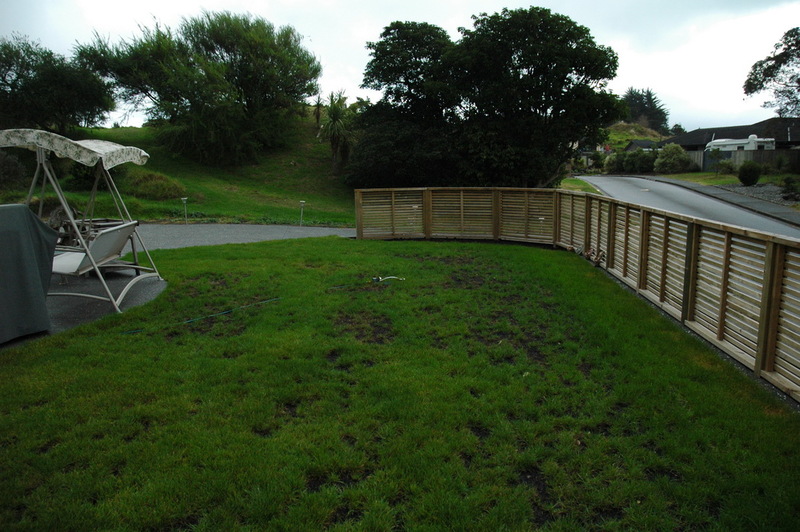 The other quite unique thing about our patio is that we have had pebbles and paua scattered all through. The pebbles are not unique, but the paua is. This looks wonderful in sunlight or even artificial light at night. I would have liked a bit more of it, but it will be OK. 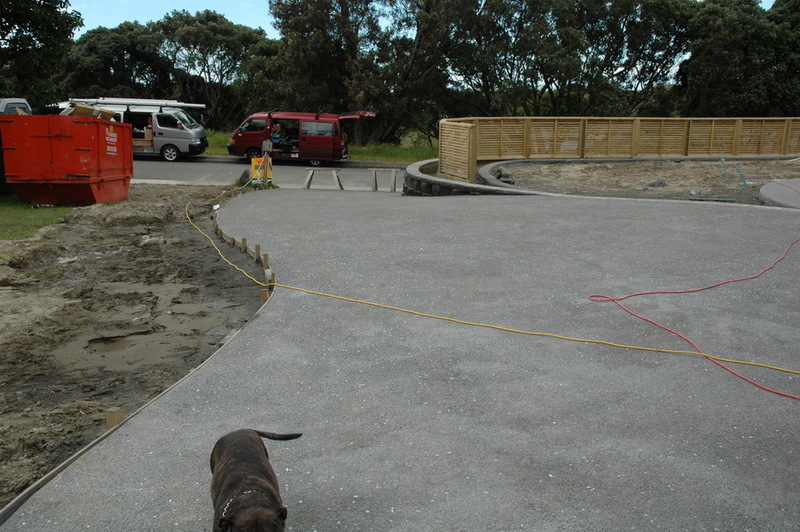 I won’t be able to show a photo of the paua until the patio has had the final coating installed. This then makes the paua glisten more. 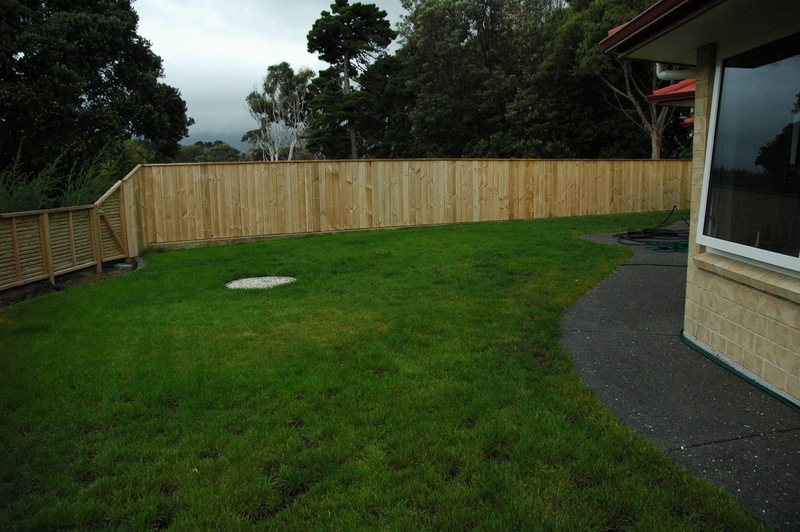 The next photo shows the mowing strip in front of the front fence. 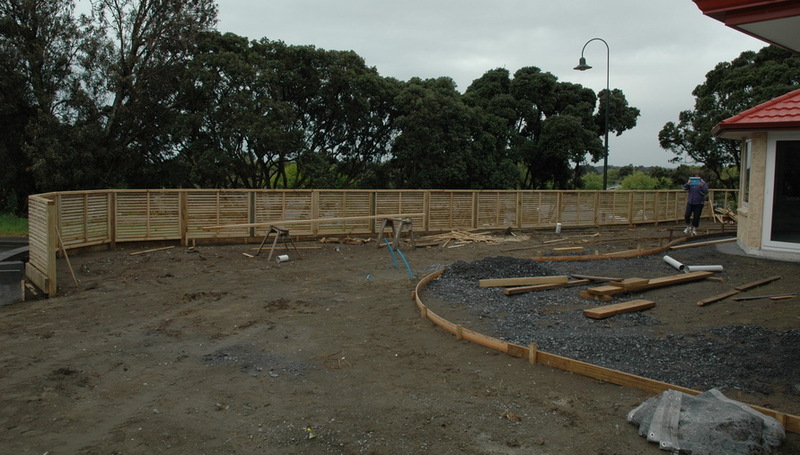 In the foreground is where we will have another small garden. There is another bit like this at the far end on the rounded corner. We will eventually have another small retaining wall and fence continuing on from the end of this one all along the east side of the section as we want to have a narrow vegetable garden along this fence. 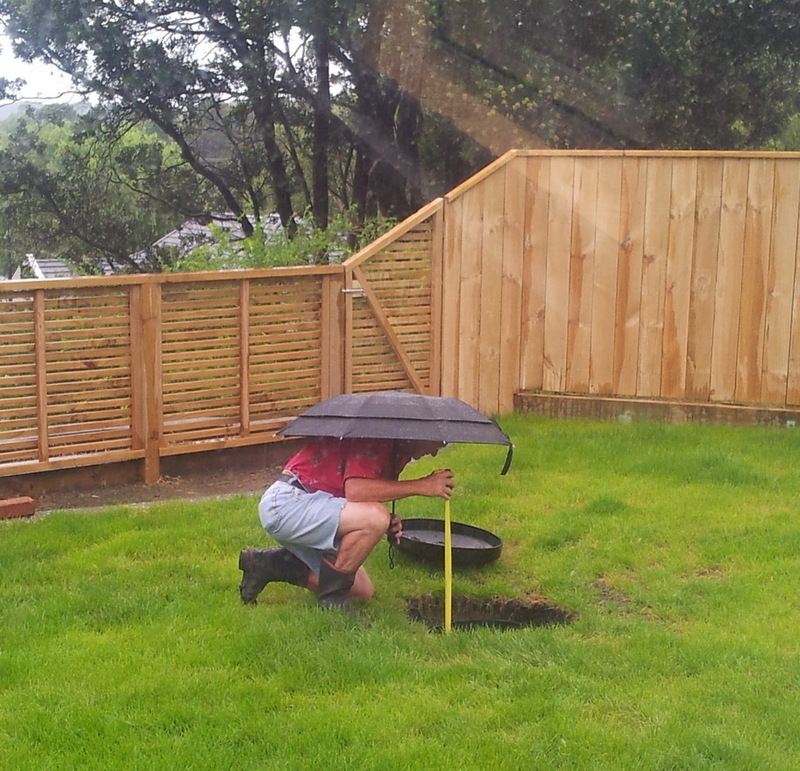 We will build this garden so it is about 50cm high, so no bending to do the gardening! This small garden is at the back of the formal lounge and side of Martin’s study. I think I may plant a climbing rose here. This is the small patio outside our bedroom. This will be a lovely place to have breakfast in the morning sunshine. 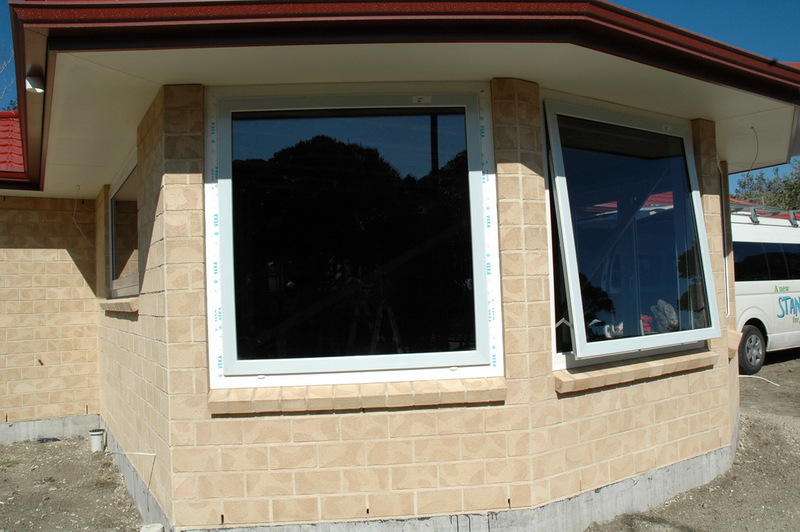 Another problem we are having is with the tiles we are having in front of the windows along the north and west side of the open plan area. 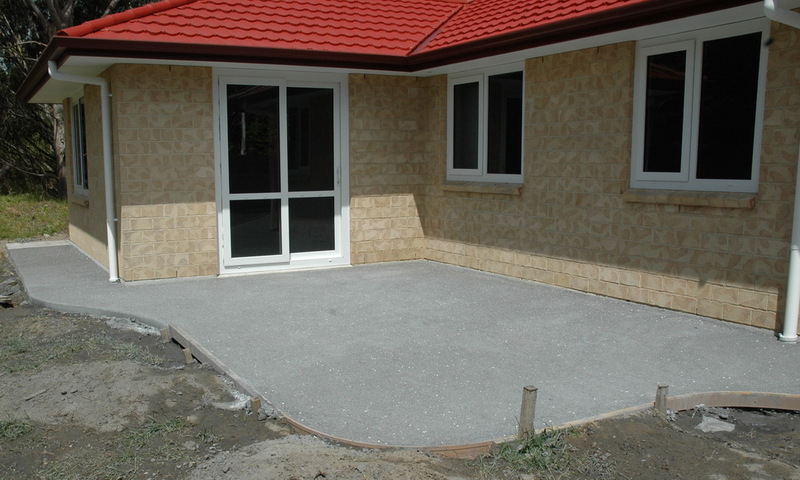 Martin had given the tile layer a layout of how he wanted the tiles laid. Well the best laid plans……….. The tile layer said he had a better idea and started putting the material to bring the tiles up to the level of our carpet where he wanted. We were furious with him doing this without consulting us. We had very carefully arranged it so when the front door was open any rain water on the door would fall on the tiles, not the carpet. Now a small portion of the door would be dripping over the carpet. So all work has halted on the tiling and we can only surmise he has the pip with us!!? 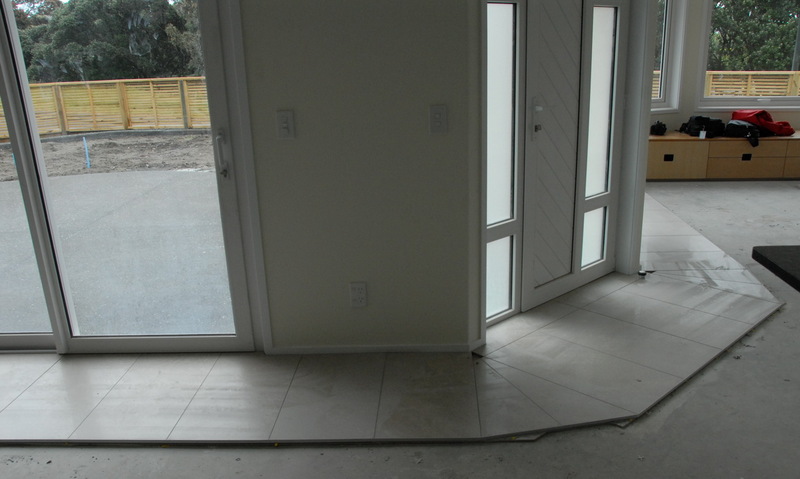 We also don’t want sharp corners where the tiles go around the corner as you can see here. The other thing the tile layer has done is take this underlay into the corner where the window seat is going to be in the formal lounge. Our solar hot water heating system is now in place and we can apply for the $1000 the government are giving to people installing these. 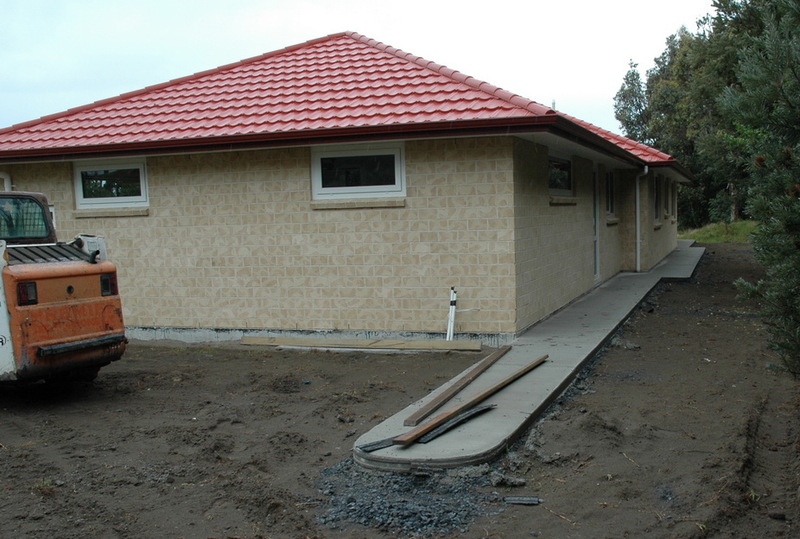 We had until 31st October to have that all totally finished. We achieved that with no time to spare! 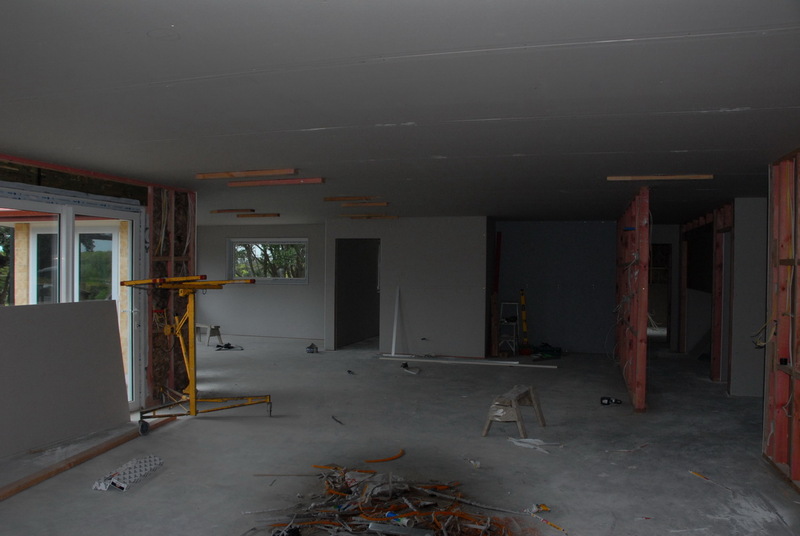 Most of the electrical fittings are now in place. We still haven’t decided totally on what light fittings we want. 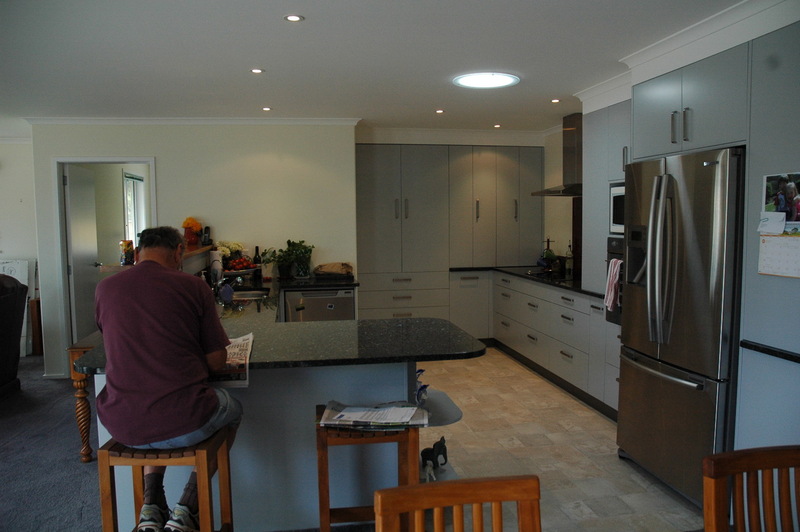 Though we do know we don’t want recessed down lights except in the kitchen, were we will have down light halogen lights. That is all for now. More hopefully after we have been back up there after the kitchen is in place next week. I have been very remiss in writing the blog over the past few days. Quite a bit has been going on at the building site. At our last visit nearly all the gib board (dry wall) has been installed. 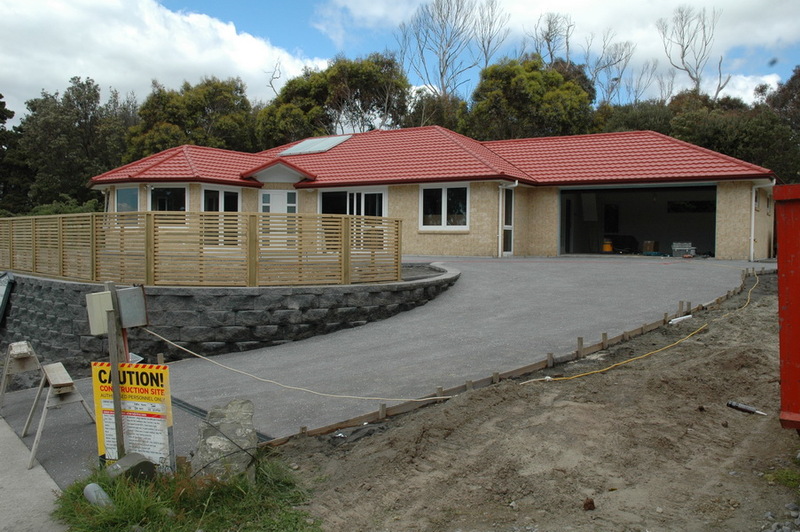 Just the garage and our ensuite to finish. 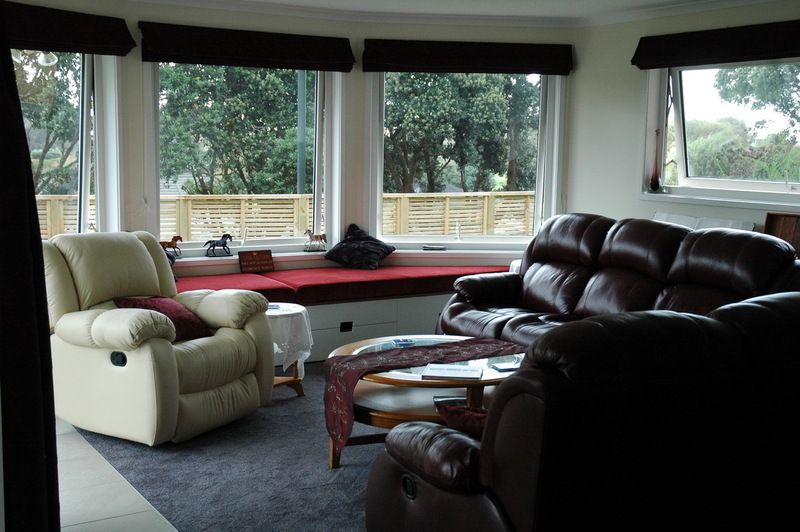 This is looking from the kitchen area towards the bay window in the formal lounge. The pieces of plank on the ceiling are used on the joins while the glue stuff hardens. The gib sheets are six metres long and weigh about 150 kg! The contraption on the left side is what is used to take the weight of the gib sheet as it is put on the ceiling. 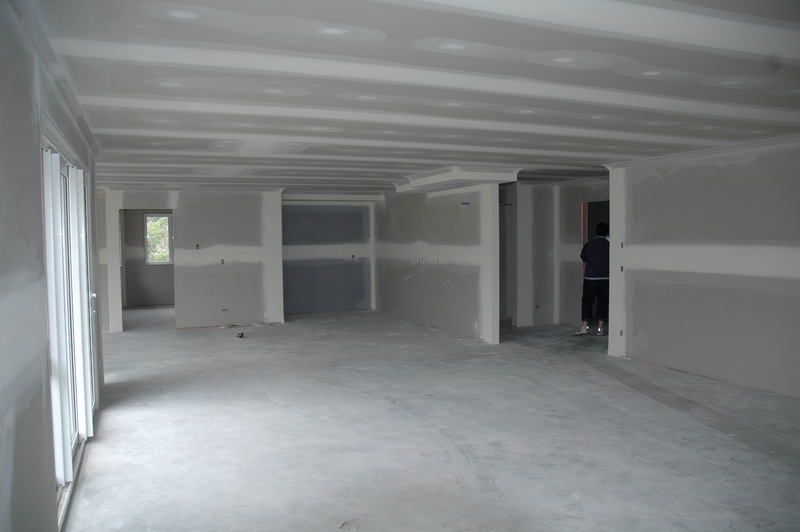 Plastering will be started this week. After that it will be the skirting boards, architraves etc. the kitchen is being made off site and will be the last thing to be installed. 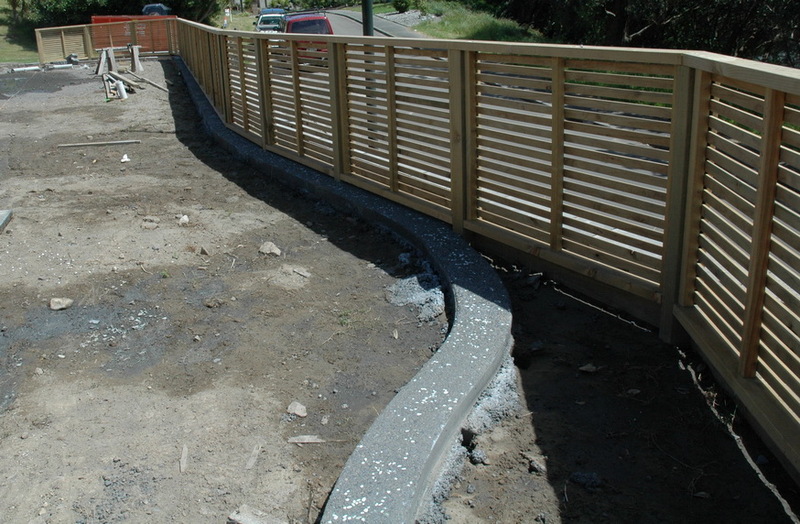 The other progress is with the retaining wall. The concrete footing for this is now in place. 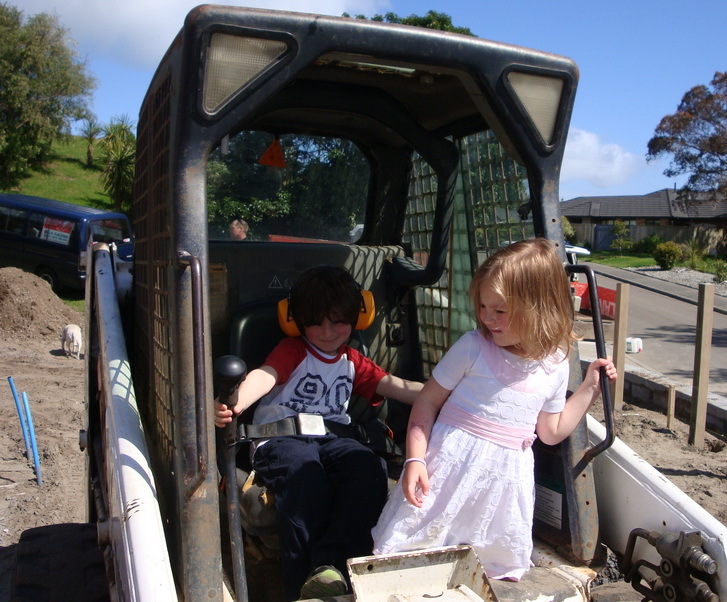 Both of our grandchildren felt very privileged and grown up to sit in the digger. More than likely something we shouldn’t have let them do. It is very hard to get a good photo of the front of the house at the moment because of the huge piles of sand being generated by digging out for the retaining wall footing. But this one is not too bad. At the same time as all of this progress we have had meetings with the curtain supplier and trying to sort out what colours we want where. Not an easy job at all. We have decided on the material and it will be the same throughout the whole house. 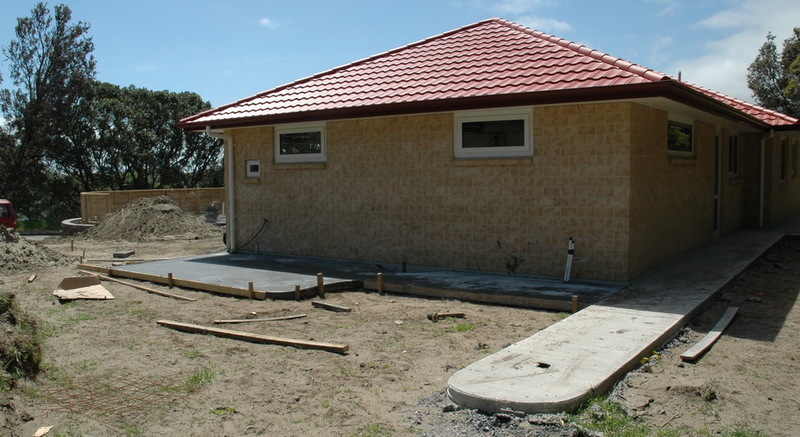 Tomorrow we have a meeting with the people who supplied the windows and doors. We are not happy with the glazing on the front door. All the rest of the house has slightly tinted glass, but the front door and side window is frosted. I think it looks horrible. We are thinking of having clear glass with some sort of etching on it. Maybe a stalk of a flax flower or something like that. We are also not happy with the frosted glass in the bathroom and ensuite. Especially the bathroom, as it makes the room very dark. We may go with clear glass there too. 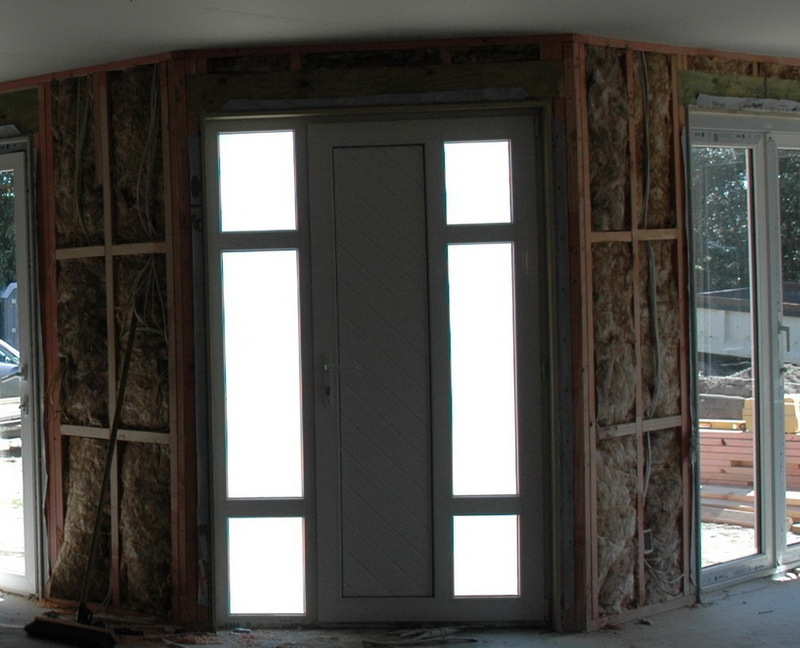 We will be having woodmate shutters in both of those rooms and these when tilted with give enough privacy. 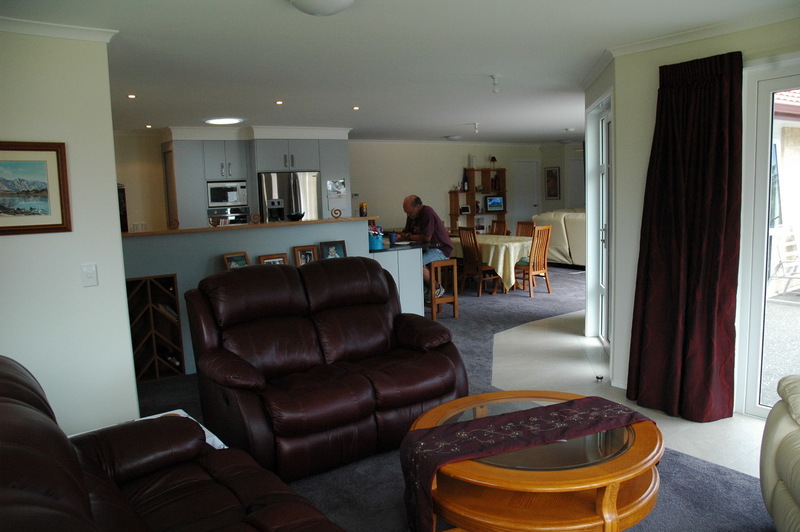 Elizabeth and I are going up there tomorrow to look at some more curtain colours and on Thursday we go over to Carterton to the paua shell factory shop to get some paua pieces that will be sprinkled in the concrete on the patio. Wednesday 19th. We have just come back from another trip up to our new house. We had to go and see the curtain people again, and even then I forgot to bring one of the samples home that we had chosen. Will get it next time. Anyway one wonderful thing has happened. 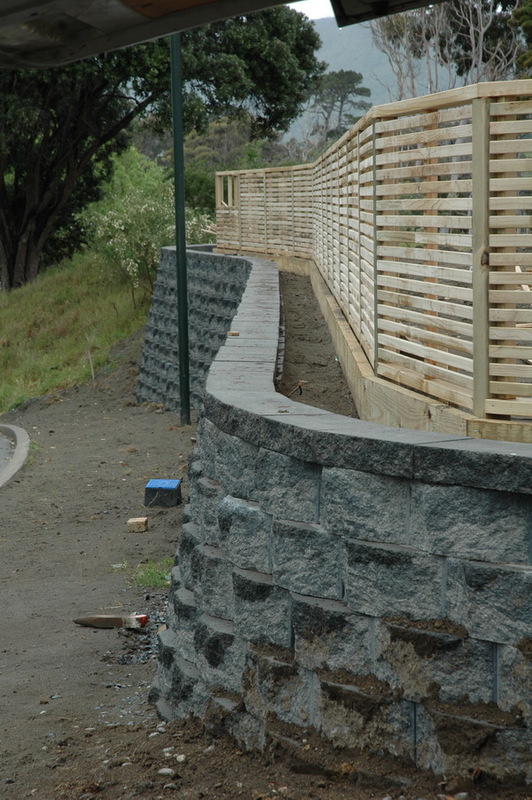 The retaining wall is nearly finished. This just since Monday!! Wow!! It is huge. More next time. What a surprise we had when we arrived at our section yesterday. All the bricks were in place. We had been told it may take two whole weeks and it has been just six days since we were up there last. We all agree we really like the look. I had another photo taken from out front, but somehow while I was downloading it to my computer it got corrupted. 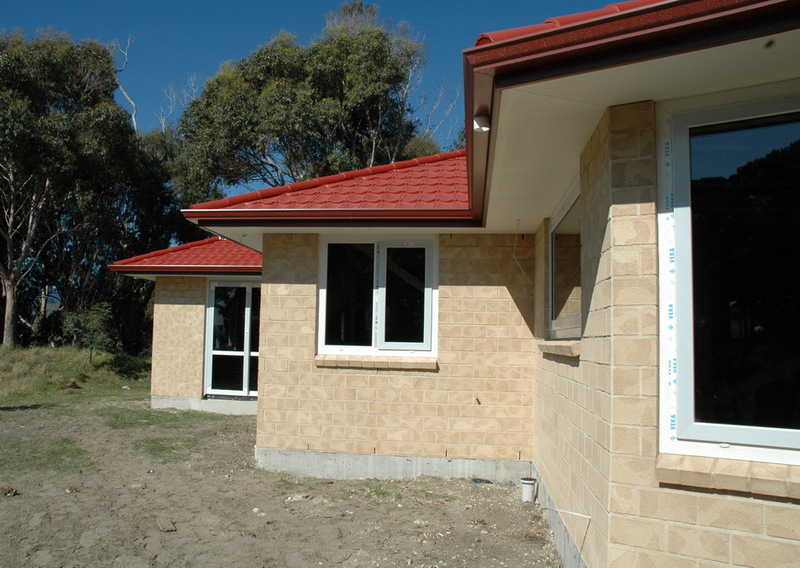 We think the lovely mellow, creamy brick looks wonderful with the bright reddish roof tiles. 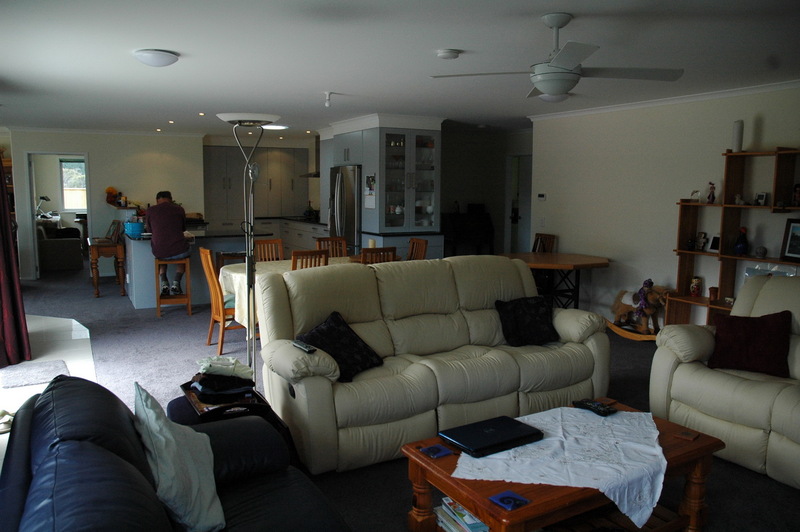 The electrician had been in and all or most of the wiring has been done. Unfortunately some of the wiring is in the wrong place. Some of these mistakes are quite important. The power outlet for my sewing machine in the laundry is actually at the back of an almost inaccessible cupboard! 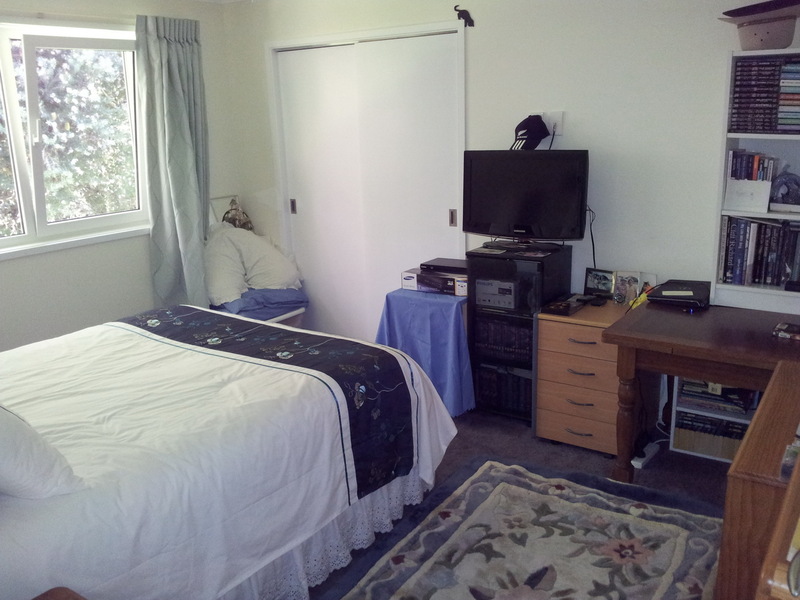 Also the one in our bedroom for a TV outlet is behind where my large dressing table with large high mirror will be. There were a few others that I can’t remember. So tomorrow we are meeting the electrician on site. The other thing that was being done is the insulation. 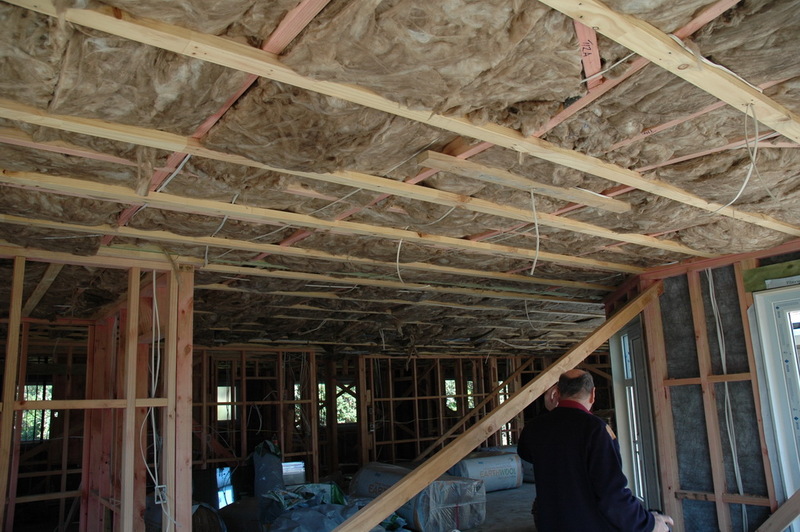 This is a very new sort of insulation. A mix of wool and recycled plastic bottles. Much more user friendly than the old fibre glass pink batts. It feels rather nice and doesn’t cause a rash when dealing with it. The four young guys had almost finished installing this while we were there. We are having the 3.6 rating in the ceiling and 2.8 in the walls. This is thicker than what you have to have. Not much else to say this time. As they say a picture is as good as dozens of words!